The overall arrangement is well organised. The staff is professional and provide safety briefing for each activities. The sky view from helicopters is exciting and beautiful. 10 mins is definitely sufficient to enjoy the ride. It is highly recommended for family with children. Discover the wonders of The Great Barrier Reef with a 4-hour water experience aboard the new deluxe activity pontoon at beautiful Moore Reef. Explore the rich underwater world of the largest living thing on Earth, which is actually visible from outerspace, and home to millions of species of colourful fish, molluscs and starfish, turtles, dolphins and sharks. From Cairns Marina, you'll depart for Fitzroy Island which you'll board the Sunlover cruise boat to take you to the beautiful Moore Reef. As you arrive at the reef and board the pontoon, you are free to do and experience any water activity available. 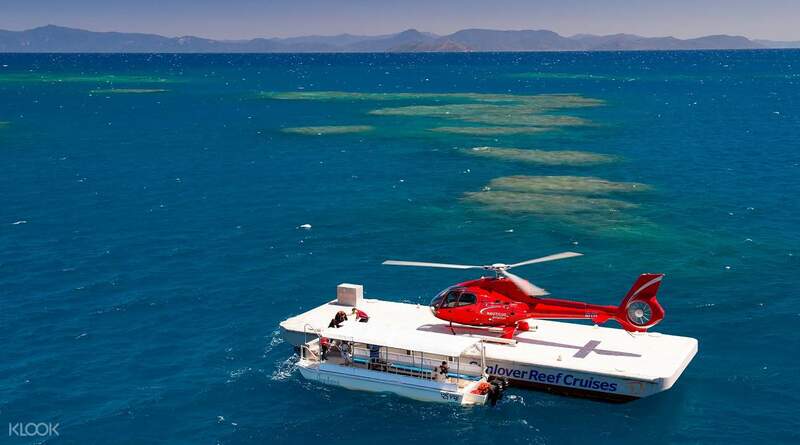 You can go snorkeling, try the theme-park waterslide, go on the semi-sumbersible tour, glass bottom boat tour, or perhaps hop on a helicopter ride for a magnificent bird's-eye view of the Great Barrier Reef. 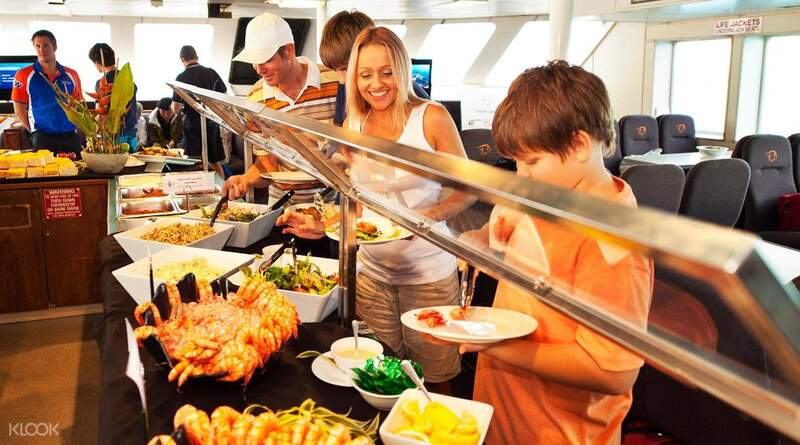 Taste the delicious tropical buffet lunch aboard the pontoon, which will definitely make you full as you go try the different activities. 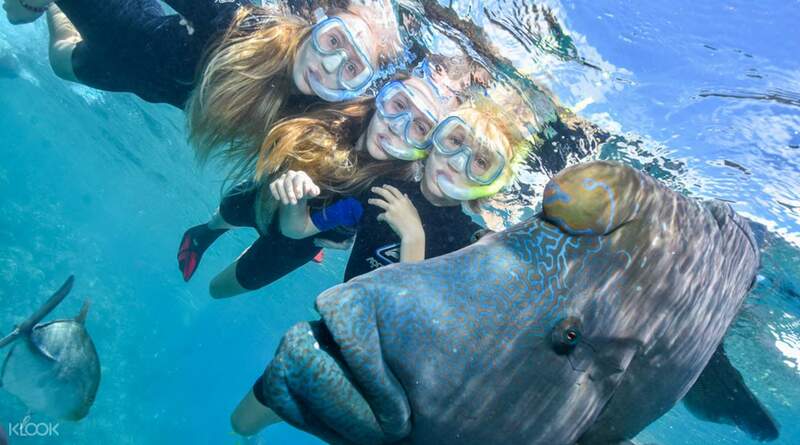 This tour is simply the best way to experience the beautiful Austrailian reef with your family and friends. Enclosed and shallow kids pool is fantastic for young children to make a splash! The overall arrangement is well organised. The staff is professional and provide safety briefing for each activities. The sky view from helicopters is exciting and beautiful. 10 mins is definitely sufficient to enjoy the ride. It is highly recommended for family with children. The overall arrangement is well organised. The staff is professional and provide safety briefing for each activities. The sky view from helicopters is exciting and beautiful. 10 mins is definitely sufficient to enjoy the ride. It is highly recommended for family with children. 5 stars for the staff and the experience. The experience was great. Staff of the cruise and helicopter ride is very helpful and accommodating. Things to take note before buying this tour as i was a little disappointed with some of the process and missed out some details and take this as a guide. *Make sure you schedule your helicopter ride early or last as it is a hassle to do the snorkeling then dry up for the ride. They scheduled us at 1:50, so we've decided to eat buffet lunch first at around 11:30-12:00. 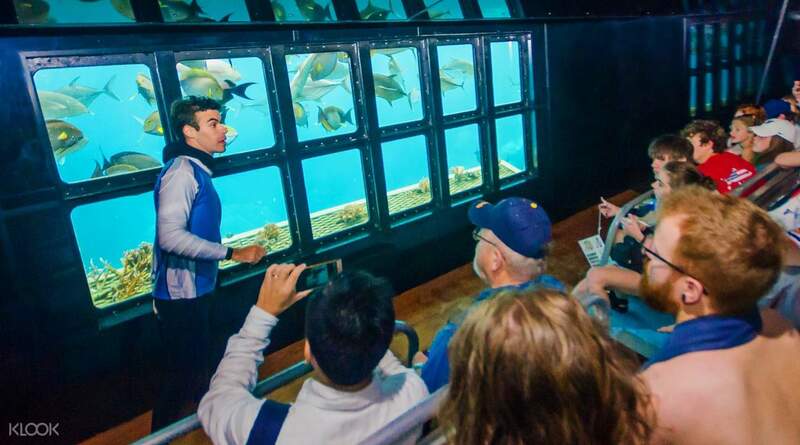 12:00-13:00 did the glass bottom boat, semi-submarine ride and view the natural aquarium. 13:00-13:30 view fish feedings and wait. 14:00-14:15 helicopter ride. So we are left of only around 1hr of reef time. * You WILL NOT alight or have a play time in Fitzroy Island! They will just fetch and alight some passengers that has taken another tour. Just take a peek out the window. *Do things Fast. 5 stars for the staff and the experience. The experience was great. Staff of the cruise and helicopter ride is very helpful and accommodating. Things to take note before buying this tour as i was a little disappointed with some of the process and missed out some details and take this as a guide. *Make sure you schedule your helicopter ride early or last as it is a hassle to do the snorkeling then dry up for the ride. They scheduled us at 1:50, so we've decided to eat buffet lunch first at around 11:30-12:00. 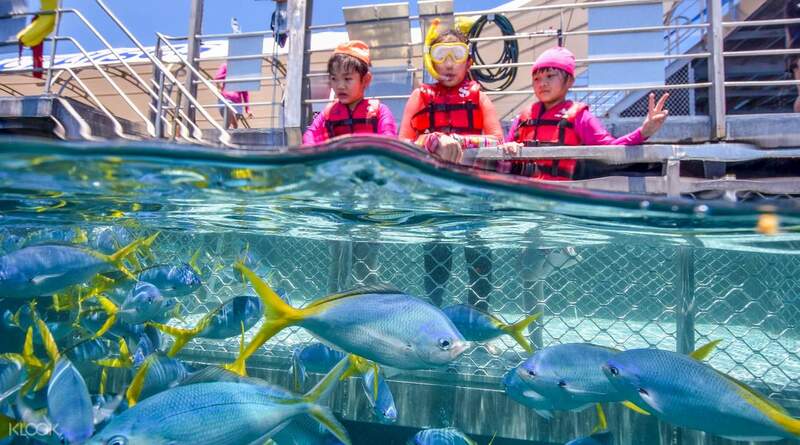 12:00-13:00 did the glass bottom boat, semi-submarine ride and view the natural aquarium. 13:00-13:30 view fish feedings and wait. 14:00-14:15 helicopter ride. So we are left of only around 1hr of reef time. * You WILL NOT alight or have a play time in Fitzroy Island! They will just fetch and alight some passengers that has taken another tour. Just take a peek out the window. *Do things Fast. wonderful!!! it is good to swin over the reef. heli trip let u see must more about the reef. must take. wonderful!!! it is good to swin over the reef. heli trip let u see must more about the reef. must take. The experience was amazing! The place is magnificent and I'll definitely recommend it. But book through a different agency, klook canceled our booking one day before and then suggested to change the date, which led to multiple calls to receive the voucher. I got it until the night before the trip! If I would've known I could have booked directly with SunLovers. The experience was amazing! The place is magnificent and I'll definitely recommend it. But book through a different agency, klook canceled our booking one day before and then suggested to change the date, which led to multiple calls to receive the voucher. I got it until the night before the trip! If I would've known I could have booked directly with SunLovers. Thank you for choosing Klook and taking time to leave us a review. Klook always strives to provide customers with better deals and services - glad that you had a great experience! Thank you for choosing Klook and taking time to leave us a review. Klook always strives to provide customers with better deals and services - glad that you had a great experience! 0845 Caiens Fleet Terminal Registration Collection. 0930 Departure from the Great Barrier Reef. 1130 Arrived at the Great Barrier Reef. 1200-1330 Lunch time, there are tiger shrimp, cold meat frozen dish.哩 哩 beef rice and long pass powder. Tea coffee is free. Helicopters, Seawalker and diving are all available for all types of water activities. Snorkeling, semi-submarine, glass bottoms to see corals and fish free. On the helicopter, you can bring your own camera. 1530 Leave the Great Barrier Reef about 1720 and return to Cairns. 0845 Caiens Fleet Terminal 報名集合. 0930 出發大堡礁行程。 1130 到達大堡礁。 1200-1330 午餐時間, 有虎蝦, 冷肉凍盤。架哩牛肉飯及長通粉. 茶水咖啡免費。 各類水上活動都有，直升機, Seawalker 及潛水都是收費。浮潛，半潛艇，玻璃船底看珊瑚及魚免費。上直升機，可以帶自己相機. 1530 離開大堡礁約1720，回到Cairns.